I have been studying the Alexander technique with Elyse for about three months and it has changed my life in many happy ways. Most of the changes have to do with my physical experience of the world – how I stand, sit, and use my neck and back – but I have also found myself becoming much more alert to the meaning of human posture in the people I see and in images I encounter. I notice how people hold themselves when they talk to me and when I see them on television or in print media. Indeed, I have found myself fulfilling a prediction about the feelings of new students that I’ve read in various books about the Alexander technique: I have wanted to sidle up to egregious head-hangers and shoulder-slumpers and tell them all about Alexander and how it can change their lives. However, I have so far heeded the warning from Alexander teachers and kept my thoughts to myself. One exception to this rule arose in relation to my academic work. I am a medievalist; I study Middle English literature and culture, which includes medieval manuscripts and the images that appear in them. Something I have been focusing on in my research is the human face as it is represented in the visual arts and literature during the medieval period. I recently gave a paper at a conference in New York on the drawings of faces in the margins of medieval manuscripts. I first collected quite a number of these drawings, prepared a PowerPoint presentation, and then sat down to write my paper. One of the first images I was planning to show was, I thought, a fairly simple illustration of how scribes drew faces to illustrate the content of a manuscript page: the manuscript contained the Rule of St. Benet, a rule for the religious and spiritual life of nuns, and the particular page I showed concerned praying in the chapel. The rule stated that nuns should engage in contemplative prayer, an intense form of meditation on Christian teaching, including Christ’s Passion, which would necessarily involve weeping. But because the nuns would be meditating together in the chapel, the rule instructed them to be as silent as possible, so as not to disturb their sisters and disrupt their meditations. At the top of the manuscript page, the scribe had drawn an image of two women in profile, one in front of the other, both facing left, as if they were sitting in a chapel facing the altar. Both were weeping. When I first saw the image, I quickly looked at it and diagnosed it as a straightforward depiction of what was on the manuscript page – nuns in the chapel at contemplative prayer, weeping silently and respecting each others’ spiritual space. But that was before I had started to work with Elyse on the Alexander technique. By the time I was writing my paper, I had had several sessions and had become acutely aware of the head and the neck and how people use and misuse them. When I looked again at the image of the two women, I could see that the woman on the left was holding her head and neck in a ramrod-straight and stiff position, perhaps even slightly tilted back, while the woman behind her (on the right) was inclining her head forward. This discrepancy struck me very strongly. Why were these women presented so differently? I noticed further discrepancies. Because they were depicted in profile, only the left eye of each woman was visible. The eye of the woman on the left, in front, was drawn in such a way that she appeared to be looking backward at the woman on the right. In contrast the woman behind her, on the right, was staring vacantly into space. The woman in front was frowning; the woman behind her had her mouth open. What did these details add up to? Going back to the posture of the two women, though the woman in back did not demonstrate good use in an Alexander sense– she was inclining her head forward and hanging its weight from her neck – she was demonstrating the proper position for reverent prayer. Her unfocused eyes showed that she was meditating deeply. And, most importantly, her open mouth showed that she was vocalizing – violating the rule as stated on the manuscript page, which enjoined the nuns to pray silently. The noise she was making explained the posture of the woman in front. She wasn’t bending her neck reverently; she was distracted by the noise of her sister, which led her to lift up her head, look back at her, and frown disapprovingly. Far from being an image of nuns following the rule, the portrait of the two women was instead an image of distraction, a picture of two people unable to share the same space. I do not think that I would have noticed the difference between these two images had I not been studying the Alexander technique and thinking every day about how I hold my neck and head. I simply wouldn’t have been able to see what the medieval scribe was trying to show me. 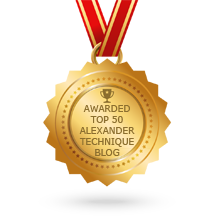 The Alexander technique is first and foremost a practice of the body, of course. But it is also a powerful interpretive method that helps us to look at images of the past in a new way. **Due to copyright issues the images that relate to this post cannot be reproduced.